To hone the skill of our students, we provide continuous special classes during Summer Vacation. The time duration is 15th May to 16th June of every year. Apart from basics students learn new items according to their respective levels of experience. For the students coming from abroad, we organize summer classes till the end of August. 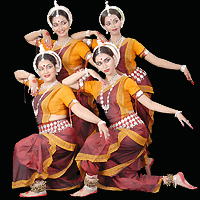 of the Odissi repertoire are practiced and teaching methods are developed through discussion and interaction with established Gurus and Dancers. There are two performing unit. Senior Performing Unit, under the guidance of Guru Aruna Mohanty ,learn new choreographies and do group rehearsals for different productions and programmes. The classes of Junior Performing Unit held five days a week and three hours each day. Students practice to perfect their skill to be presented as solo and group performers in the state and national level. At this stage personality development, good communication skill, interpretation of literature etc. are given due importance. For their over all development as an artiste we have incorporated music and rhythm sense. Short courses are offered at different times of the year to accommodate the need and requirement of the students coming from different parts of India. As per their specification and the evaluation of the expert committee, teachers are assigned to work with students. With individual lessons sometimes the students are encouraged to attend group classes. The courses are designed according to the time frame specified by the student. Not only we take care of their professional need. We also look after their social needs to make them feel at home. When requested, we arrange paying guest facilities with very reliable families keeping their security in mind.